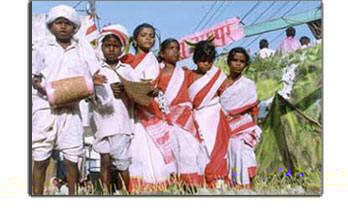 Several Harvest dances are prevalent among the tribal communities of Madhya Pradesh. The Oraons perform Sarhul dance after the Kharif crops are harvested. Through the dance the gods are thanked for the crops and they are prayed to grant the community a happy life. On the full moon day of the lunar month of Chaitra, corresponding to March/April, this dance is performed after worshiping a Sal tree. This is the time when Sal trees blossom. There is a tribal myth associated with the worship of a Sal tree. The myth is as follows : Oppressed by a king of Bihar, the Oraon tribe fled to a Sal forest in Madhya Piadesh. The Sal trees not only gave them shelter but also necessary means for their living. Sal trees for the Oraons are symbols of protection. In gratitude, therefore, they worship a tall Sal tree every year and perform the Sarhul dance around it. The entire village go near the selected Sal tree every year on the full moon day of Chaitra and in a ritual give it their offerings. Then men and women dance around the tree throughout the night. Often dancers from other villages are also invited to join the festivities. While dancing the dancers sing and musical accompaniment is provided by Mandar, a cylindrical drum with two faces, Nagara, a large hemispherical drum with one face, Jhanj, the cymbals, and Chatkola, a kind of castanets. The dancers are all in white. Men wear peacock feathers on their back side waist and women decorate their buns with white feathers or cranes and white flowers. The dance is usually in a fast tempo.